I think this is a very interesting verse. Paul himself was struggling with sin. 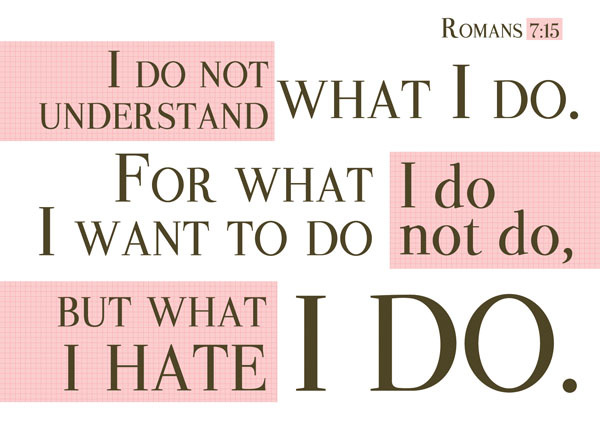 He says, I do not understand what I DO but What I hate I DO. What he wants to do he does NOT DO. I guess we all struggle with this concept. To be perfect and free from sin is quite a difficult task. We can only avoid sin through the Grace of God. The Grace of God is very powerful and if we have God’s Grace, you can be sure that you will be always able to avoid sin and its consequences. So, my dear brothers and sisters, I think it is best that we pray continuously to be in the PRESENCE OF GOD. For if we are continuously in His Presence, He will give us the Grace to be free from sin and its consequences.